Nothing gets me more excited than picking up a fantasy novel and diving right in. I love completely immersing myself in a whole new world. One that I never could have imagined in my wildest dreams. 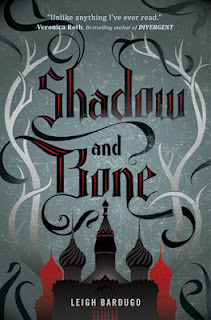 So I was super excited to read Leigh Bardugo's debut Shadow and Bone. I'm not going to lie, the very beginning of Shadow and Bone was slow, and slightly confusing. But it wasn't a big deal because after a while it all fell back into place. The Grisha were very interesting. The whole group was shrouded in mystery, and while we got a taste of what they are like in this book, I cannot wait to find out even more in the next book. Leigh Bardugo was very good at getting me distracted so I would focus on one thing while a whole new thing was unfolding right under my nose. She was very good at showing instead of telling and I really appreciated that. The Darkling was very appealing to me. I loved learning more about him and he totally surprised me again and again. I also liked Mal. When he first arrived I felt like he popped out of nowhere but I like the way it was revealed that he was woven into the story. Leigh was very good at making most of the characters vital to the plot rather than just statues in the plot. Overall I would recommend this book to lovers of fantasy as well as people who are looking to get into fantasy, just beware of the very beginning! I have heard so many great things about this book. I must get a move on a get grab a copy.